The top diagram shows how the strength of sunlight is less nearer the Earth's poles. The lower map shows how much solar energy hits the Earth's surface after clouds and dust must have reflected and absorbed some solar energy. It is used by plants for the process of photosynthesis. To use cooking (solar cookers). 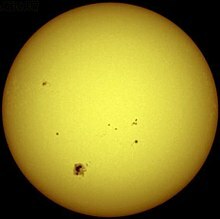 Solar radiation reaches the Earth's upper atmosphere with the power of 1366 watts per square meter (W/m2). Since the Earth is round, the surface nearer its poles is angled away from the Sun and receives much less solar energy than the surface nearer the equator. Topaz Solar Farm USA 35°23′N 120°4′W﻿ / ﻿35.383°N 120.067°W﻿ / 35.383; -120.067﻿ (Topaz Solar Farm) 7002500000000000000♠500 installed capacity as of June 2014. California Valley Solar Ranch USA 35°20′N 119°55′W﻿ / ﻿35.333°N 119.917°W﻿ / 35.333; -119.917﻿ (California Valley Solar Ranch) 7002292000000000000♠292 399 First 130MW connected Feb 2013. Solar cooking uses the Sun as the source of energy instead of standard cooking fuels such as charcoal, coal or gas. Solar cookers are an inexpensive and environmentally sound alternative to traditional ovens. They are becoming widely used in areas of the developing world where deforestation is an issue, financial resources to purchase fuel are limited, and where open flames would pose a serious risk to people and the environment. Solar cookers are covered with a glass plate. They achieve a higher temperature by using mirrors to focus the rays of the sun. Solar cells have many applications. They have long been used in situations where electrical power from the grid is unavailable, such as in remote area power systems, Earth-orbiting satellites and space probes, consumer systems, e.g. handheld calculators or wrist watches, remote radiotelephones and water pumping applications. A large no. of solar cells are combined in an arrangement called solar cell panel that can deliver enough electricity for practical use. Electricity produced by solar panels can be stored in rechargeable solar batteries, which is then drawn upon when required. ↑ A solar panel in the contiguous United States on average delivers 19 to 56 W/m² or 0.45 - 1.35 (kW·h/m²)/day. "us_pv_annual_may2004.jpg". National Renewable Energy Laboratory, US. Retrieved 2006-09-04. ↑ Meza, Edgar (27 June 2013). "NRG Energy completes 250 MW California Valley Solar Ranch". Solar Energy Industry Association. Retrieved 5 July 2013. ↑ "First Solar Stops Installation at Agua Caliente Project". Bloomberg. ↑ "AV Solar Ranch One". NextLight Renewable Power LLC. 2009. Retrieved 2009-06-06. ↑ "Solar Batteries | Natural Solar". Natural Solar. Retrieved 2018-11-01. Solar Energy Industries Association is the national trade association for the US solar energy industry and has information on current commercial technologies and market developments. Online article by scientist Jonathan G. Dorn, July 22-2008 The solar thermal power industry experienced a surge in 2007, with 100 megawatts of new capacity worldwide. This page was last changed on 13 April 2019, at 01:57.